I have managed to get my hands on some Colourpop! Yay! I’ve heard really good things about the brand in general. Colourpop shadows have had a lot of hype about them over the past couple of months and with good reason. The only thing negative I have found is that they are very prone to smashing because the formula is so soft. It’s somewhere between a cream and a matte texture that you could probably compare to butter. That is one of the things that first drew me in and made me cave. The ones I managed to get my hands on are the metamorphosis be the change x CoffeeBreakwithDani quad. Having heard only good things about the brand and this collection in particular, I had high hopes and oh boy did these deliver! They are a whole new level of beautifulness! As we are in the UK, you may not know that CoffeeBreakwithDani is a Youtube channel, run by a lovely lady by the name of Dani. 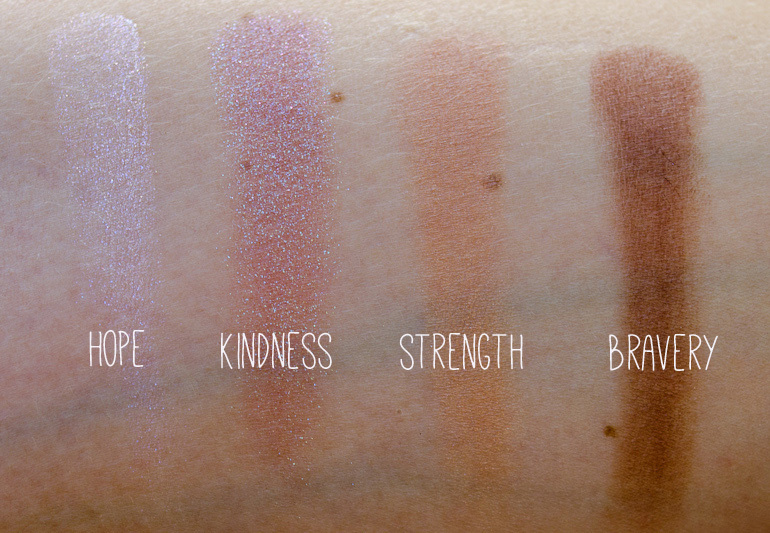 The concept of the shade names in this palette is all about making a difference. The way that she has achieved that (and I think she has) is by making two of the shadows into what they call transformer shades. It’s not what your thinking, its not about the robots! What they are able to do is ‘transform’ any shadow you use normally and I mean ANY shadow into a different colour. Because the two shades have so many beautiful colours in them, the colour of the shadow you use underneath will pick up that particular colour making it pop. The two transformer shades are named Hope and Kindness. There is a link to her video here which shows you exactly what I mean, if I’m not explaining myself very well. With this particular collection of shadows, you get 4 shades. Hope, Strength, Bravery and Kindness. These are all traits which I would love to have in my personality. Hope (transformer shade) – Is a white/silvery shadow, with undertones of pink and purple running through it. It’s a very unique colour and would be beautiful used in the tear duct area as well as through the centre of the lid to finish off your eye look. Strength – A caramel matte light brown which would be an extremely good base, or used in the crease of a lighter eye look. Bravery – The only matte brown that you need in your life. 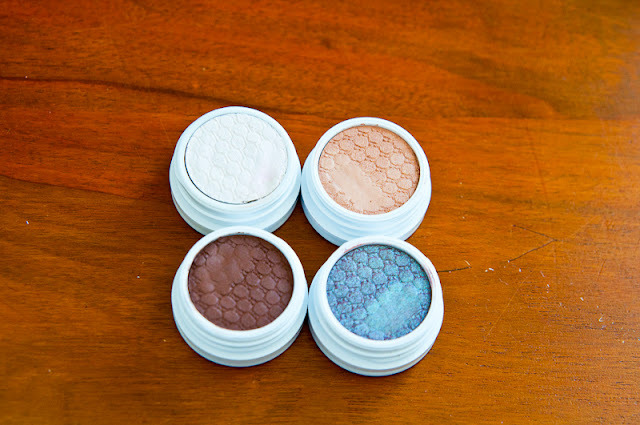 It is an extremely versatile colour and can be used to create so many different eyeshadow looks. Although it’s a brown, it has a nice amount of warmth to it, so can be used as a transition shade as well. Colour pop isn’t available in the UK, so you have to have it shipped through a 3rd party like mymallbox. I personally bought this from a group on Facebook called #bbloggers Beauty Swaps and Sales of which I’m a member. But I do know of people that have used the mymallbox service, so I know it’s trustworthy. I will have to make an order soon! I would love to be able to tell you that I hated these…. but I just don’t! I think they are amazing, pigmented and did I mention that they are only $5! A definite bargain. I really hope they become available in the UK soon. Have you tried Colourpop? Do you have any recommendations? Want to make sure you don’t miss a new post? Follow me here on bloglovin.